Hands On Eight million people in the UK use a BlackBerry and almost every single one of those phones has a physical QWERTY keyboard. And as good as the virtual keyboard on BlackBerry's touchscreen Z10 may be - it's the best, for my money - a fair number of people will want to use a smartphone with a real keyboard. 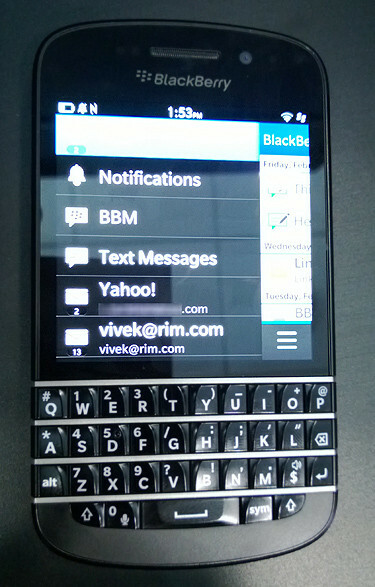 The Q10 is BlackBerry's attempt to ease the transition. Due to arrive in April, the Q10 has a QWERTY keyboard and a touchscreen, and is the first classic-style BlackBerry to run the company's new QNX-powered OS, BlackBerry OS 10. What's the handset like? 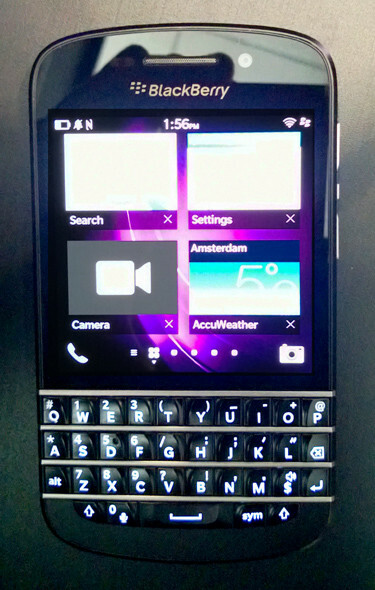 I've had hands-on time with the Q10 in Amsterdam this week at the BlackBerry Jam developer event, and while it's still a work-in-progress, the phone ticks all the boxes. 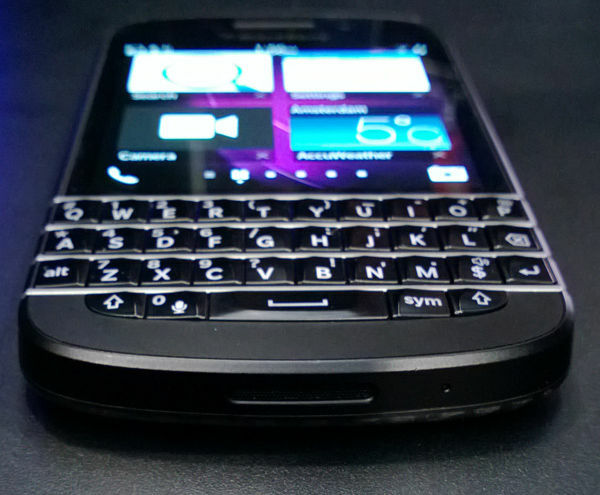 The Q10 has the biggest battery (2,100mAh) and the largest keyboard of any BlackBerry. Once upon a time BlackBerrys could run on a single AA battery - and for years had a great reputation for battery life. The combination of 3G and an increasing reliance on Java killed this: a modern BB OS 7.x device typically won't last into a second day. The battery and smaller screen should allow the Q10 to exceed this comfortably. The build quality is outstanding: the battery cover is made of a "glass weave" material that TCOKARIM* says is twice as durable as plastic; it as a stainless steel frame; and an excellent keyboard. The key rows are straight, rather than curved, but the buttons go all the way to the edge of the device and are bigger than the Bold's keys. It's about 9g heavier but feels comfortable and well proportioned. The screen is also quite outstanding: graphics on the 720x720 resolution, 3.1-inch square display look very crisp at 330ppi. Internally, BlackBerry has squeezed in a dual-core 1.5Ghz processor with 16GB of flash, plus room for expansion. And, like the Z10, it has HDMI output and 4G mobile internet connectivity. Before laying hands on the Q10, I was concerned that BlackBerry OS 10's reliance of touchscreen finger gestures would force owners of the QWERTY-keyboard phone to juggle the device in their hands to perform actions. But this isn't the case: everything's comfortably within reach of the thumb in one-handed use. BlackBerry has tweaked the OS a little for the Q10 to suit the form factor: user interface controls are slightly resized, and the Active Tiles are square rather than rectangular. The 720x720 calendar looks impressive in black and purple. The ubiquitous search icon is missing but the QWERTY keyboard activates a universal search screen from anywhere in the Home area, much as it does in BB OS 7. Search is so well done in existing BlackBerrys that I never use the app launcher nor contacts book; this has been ported to the new OS, where search is generally easier to use. One new feature was shown this week: and it's a work in progress provisionally called "Type and Go". With this, you type in a [verb] [object] into the universal search box - such as "Email Chris" - and the system prompts you with a list of possible related actions, the top one being, in this case, to send Chris an email. BlackBerry told us that the familiar shortcut keys (explained in this brilliant brief history of the BlackBerry user interface) will be carried forward. 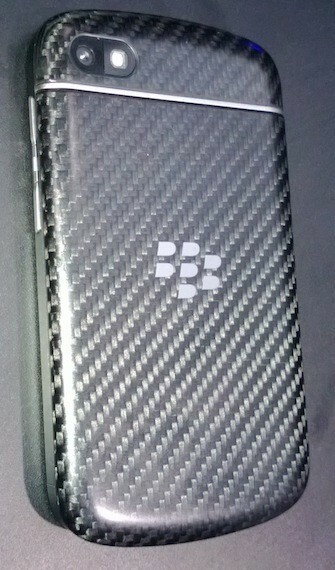 But perhaps it won't be as customisable as before. Currently, you can save a search (such as "emails from Lewis" or "all flagged messages") and give it an alt+shift+hotkey. TCOKARIM wouldn't say if this is possible on the Q10. Let's hope it is, for the real benefit of physical QWERTY brings the power-user is customisable shortcuts. All in all, it's a worthy upgrade, both for loyalists who have stuck with BlackBerry through choice, or have had one handed to them by their IT staff or government department. TCOKARIM said the Q10 will run the next revision to the new OS, BB OS 10.1, which includes some bug-fixes and should also be available for the all-touch Z10 at about the same time. BlackBerry hinted that some user interface tweaks may be introduced in response to the initial round of feedback - but perhaps not in 10.1. The new platform could use one or two - it isn't perfect, but it does look very good indeed.